Dr Azad Hussain is an experienced engineering professional with over nine years of industrial and academic research experience. He completed his PhD studies in 2004 at Queen Mary College, University of London, in the field of biomechanics, biomaterials and tribology. 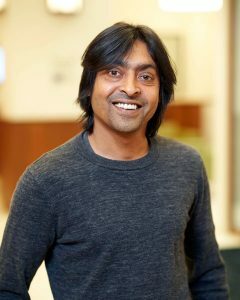 Upon his PhD completion, Azad worked as a research scientist on an interdisciplinary and collaborative project with industry, focused on the research, testing and analysis of implants using new materials and designs. In 2006, Azad held a R&D engineering role at Smith and Nephew Orthopaedics. He gained valuable experience in the areas of laboratory set-up, NPI (New Product Introduction) and managing a UKAS (UK’s National Accreditation Body) accredited QMS, the first of its kind in the field of orthopaedic bioengineering. Following a career break, Azad returned to work with the Functional Materials Group at Coventry University, where he worked on various projects in electronics and automotive industry. Azad’s expertise includes manufacturing methods and process improvement, with previous applied experience in setting up QMS (ISO 17025, working in ISO 13485 compliant manufacturing site and class III medical devices).